Easily clone OneNote checklist tasks to your favorite task app. 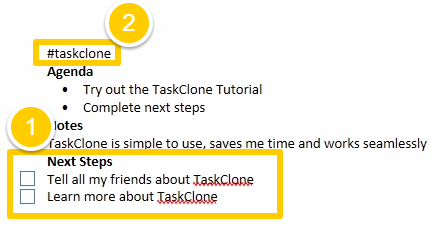 TaskClone also clones OneNote page titles as tasks. Type tasks. Use OneNote checkboxes. Do not put tasks in a table. Type #taskclone. Type it anywhere by itself on the page, but not in a table. When OneNote Syncs > TaskClone is notified of the tasks, extracts them and sends them to your task app. When TaskClone is finished > it removes the trigger tag and adds Skip Codes to each task to prevent them from being cloned again. You must sync again or wait for OneNote's auto-sync to see the changes TaskClone has made. Important! Do not edit the note again until you see the trigger tag is removed and Skip Codes added next to each task. Also, TaskClone will only process the same page once every 2 minutes. Note: Cloning page titles takes priority over individual tasks which means TaskClone will not process individual tasks from a page if the page title is being processed instead.